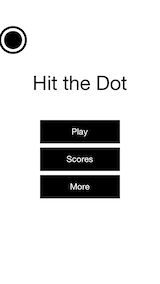 Hit the Dot is a great fast-paced game where you tap each dot to make it disappear. Do it as fast as possible to get great scores! Time Attack - Hit 20 dots as fast as possible! Speed Tapping - Hit as many dots as possible in 10 seconds! 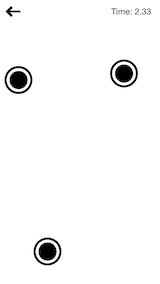 All Dots - Hit all the dots on the screen! 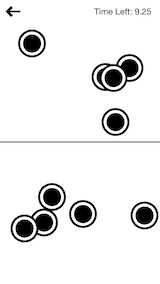 Survival - Dots slowly appear faster and faster. Don't let 5 on the screen at once! Dot Attack - Play with friends! Tap a dot to give it to the opponent. Have the fewest dots on you side after 10 seconds to win!